The patient has acquired a new, central place in mental health care. The future lies in care trajectories wherein the environment within which care is provided resembles the home environment as closely as possible. The patient is no longer required to visit the psychiatric hospital for each instance of treatment or for care. The change reduces the ‘physical presence’ aspect of psychiatric care. But the descriptive imagery used nevertheless reinforces the spatial nature of these new care relationships as well. We talk about lowering the threshold of psychiatric care, the dismantling of the psychiatric institution and the offer of care outside the hospital situation. The central place of the patient sheds new light on the pronouncement made by Michel Foucault. He wrote about the emerging science of psychiatry: “The patient himself starts feeling a little sick under the critical, scrutinising eye of the doctor.” Foucault hereby criticised the tradition in which the patient is faced with the omnipotent and omniscient figure of the doctor. 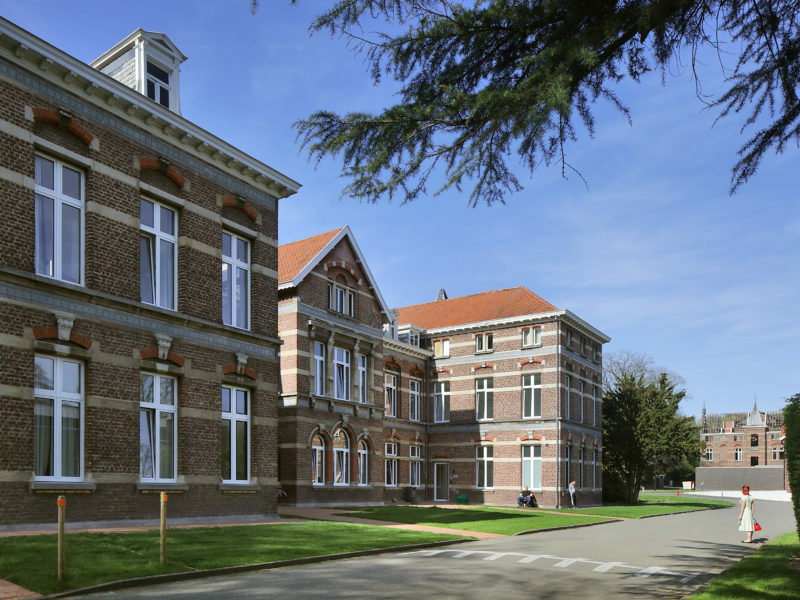 What interests us is whether the architecture of psychiatric institutions can similarly create the effect of a critical gaze on the patient. 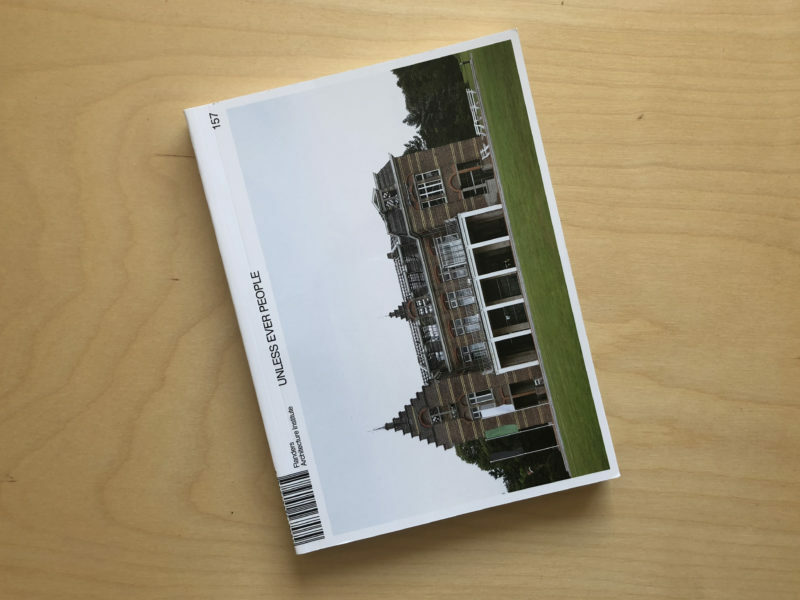 During the modernism era, Rem Koolhaas had this to say about structures: “It is the architecture that in one way or another diagnoses everyone as somehow being in need of help.” He dreamed instead of an architecture that gave the viewer a kind of superhuman strength. 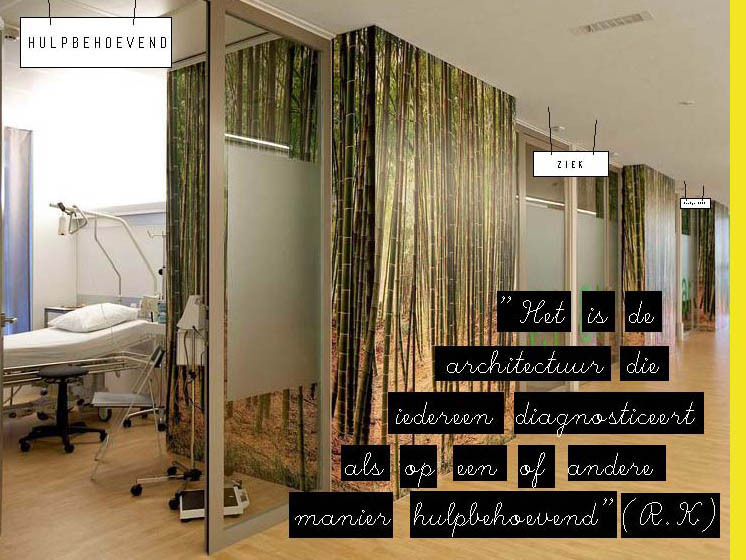 Rem Koolhaas’s insight applies to health care architecture in two ways. In the first place, the suggestion is that the spatial framework provides an initial announcement to the patient of what he may expect in the doctor’s clinic. Therefore, the spatial context in which the care relationship between the patient and the doctor takes place must itself stimulate a renewal of the healing relationship. 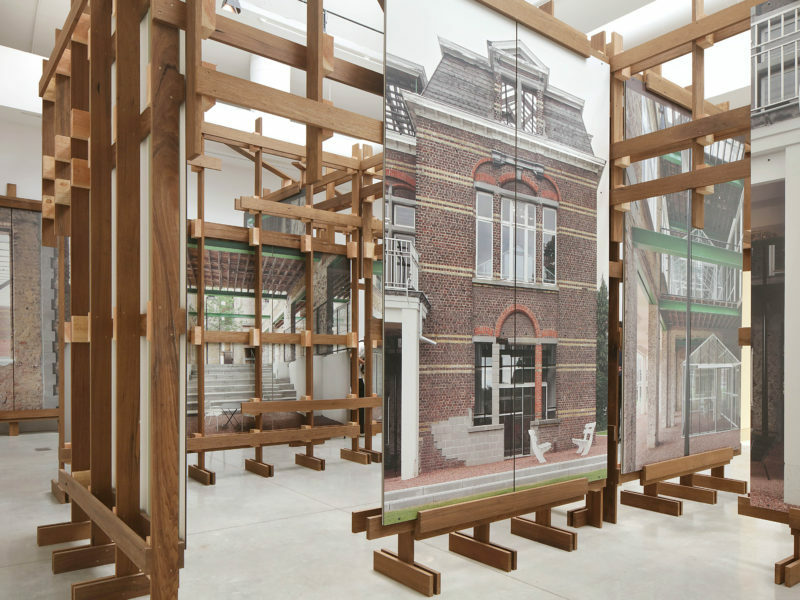 Secondly, Rem Koolhaas considers a one-sided focus on the patient to be undesirable. Since the quote cited above speaks of ‘everyone’, it is best for us to include not only patients, but doctors, staff nurses, managers, visitors, neighbours, etc. as well. In that sense, everyone is diagnosed as somehow being in need of help. Similarly, it is conventional practice to name departments in a manner that immediately draws attention to the compromised state of mind of its user. Or what about patients, visitors and new staff losing their way in a maze of buildings and departments? Not to mention the far from central location of psychiatric institutions thereby locating them far away from every kind of normal urban facility. It is easy to imagine patients in need of help, but architecture in a similar situation is undoubtedly striking. Thus guests at hospitals are generally bombarded with traffic signs and line drawings that tell him/her where to go. The question is whether aids to navigation actually contribute to the loss of the capacity to navigate. It rather seems that the aids contribute to a form of hospital psychasthenia. Edward Soja used the term psychasthenia to indicate the lack of coordination in major cities. In the absence of options to define own limits, we are compelled to adjust to the situation in which we find ourselves. 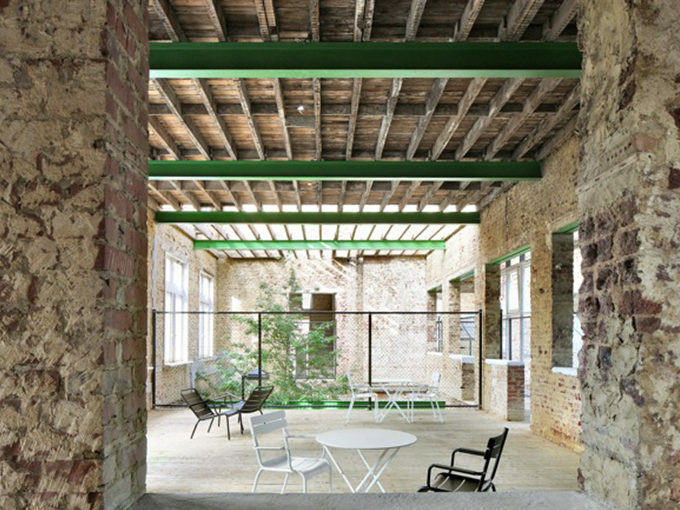 Even in care architecture, the living organism seems to disappear within the represented space. Healing environment is the fashionable term to indicate the attempt to ‘normalise’ the hospital. Every attempt is made to embellish the clinical architecture with colourful scenes, relaxing spaces and user-friendly counters. These overt simulations however do little to hide their artificial and compulsive character. The images of healing environments are laughable as their meaning is not as disturbing within the context of the mental health care. The patient does appear to become a shadow of himself in an environment that has all the makings of a hotel room or business lobby. The patient can look at a relaxing garden, but he does not have the freedom to walk on it, let alone remove weeds from it. The spontaneity of life is almost impossible to find difficult in any case. We should not overestimate the impact of architecture on the provision of care. A lot depends on the human aspect and we go by the assumption that doctors and staff are doing everything they possibly can for the patients. At the same time however, we must also not underestimate architecture. Architecture defines the physical context within which the care is provided and thereby determines what is possible and what is not. 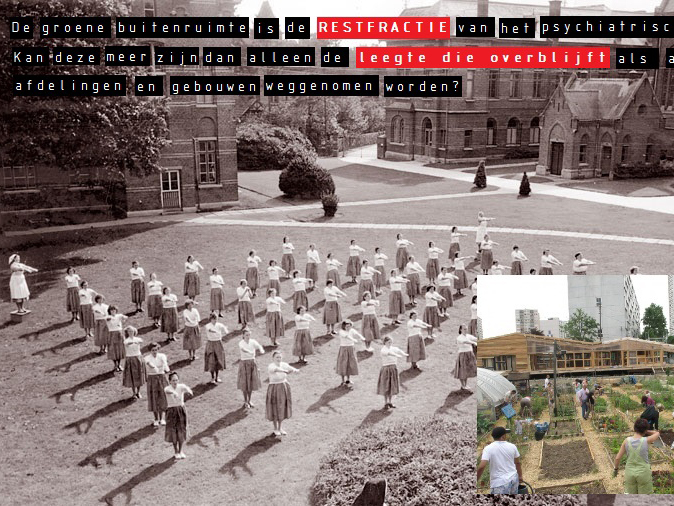 The architecture of psychiatric institutions defined boundaries with the outside world with the same completeness with which it defines the restrictions and freedoms that apply within the psychiatric institution. Nowadays, the outer boundaries are being redrawn by locating departments within the normal urban fabric (such as private care facilities and sheltered housing) and outreach (Centres for Mental Health Care (CGG), home-based care, etc.). The greatest challenge is in redefining what you could call the internal borders of the psychiatric institution.